Classic FM: Choice of the week, June 2013: "This week David's Conoisseur's Choice is an outstanding Wagner recording in his bicentenary year". 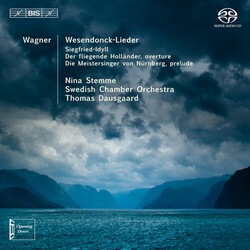 In their exploration of the symphonic repertoire of the Romantic era, Thomas Dausgaard and his Swedish Chamber Orchestra have previously recorded Bruckner, Tchaikovsky and most recently Brahms, in performances described as ‘exhilarating’ (The Observer) and ‘stirring’ (ClassicsToday.com). As they take on the music by another archetypal nineteenth-century composer, Richard Wagner, they are joined by one of today’s foremost Wagner singers. Named ‘Singer of the Year’ by the magazine Opernwelt in 2012, Nina Stemme has been the Isolde of choice at Glyndebourne, Bayreuth and Covent Garden. She here performs the five Wesendonck Songs – of which two in particular, Im Treibhaus and Träume, were referred to by their composer as ‘studies’ for Tristan and Isolde. Wagner himself prepared a version for violin and orchestra of Träume, which the conductor Felix Mottl incorporated when, supervised by the composer, he made an orchestration of the set. 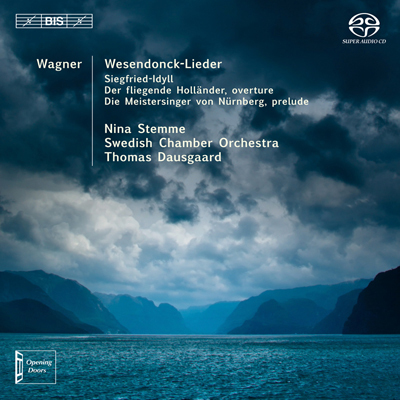 These songs to texts by Mathilde Wesendonck, Wagner’s muse during the 1850s, are framed by two versions of the overture to The Flying Dutchman, the rarely heard 1841 original version and the composer’s final creation from 1860, with its new ending inspired by Tristan, composed three years earlier. Concerning his revisions, Wagner wrote to Mathilde: ‘Now that I have composed Isolde’s last transfiguration, I could at last find the right close for this Fliegender-Holländer overture’. Included is also the Siegfried Idyll, composed in 1870 as one of Wagner’s few purely orchestral works. It is known by this title because it was presented as a gift to Cosima Wagner, who had recently given birth to the couple’s son Siegfried, but also because it uses themes from the opera Siegfried, which was then nearing completion. Closing the disc is the stately prelude to another opera, Die Meistersinger von Nürnberg, in which Wagner with a spectacular use of counterpoint – ‘applied Bach’ was his own description – aspires to express the idea of a reconciliation between artistic freedom and respect for tradition.